The May 2016 planner is here! 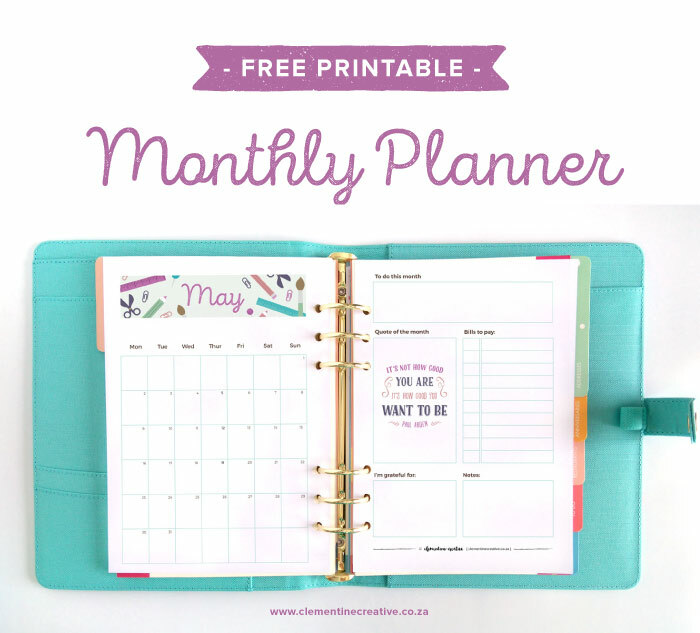 This is a printable monthly planner delivered to email subscribers at the end of every month. If you would like to get your own, read on. You will receive this planner in A5 size (fits an A5 Filofax and large kikki.K organiser) and A4 size. On one sheet you’ll get a small calendar where you can write down events, important dates, birthdays or even your fitness routine. On the other sheet is a motivational quote to inspire you as well as spaces to write down reminders, bills to pay, etc. The inside of the boxes are meant to be filled in by hand. This printable monthly planner is delivered to email subscribers at the end of the month. If you aren’t a subscriber yet and would like to receive this planner NOW and a new planner every month, join my newsletter below (it’s free! ): Not only will you receive the planner of the month, but you also have access to a secret library of free printables not available on my blog. Yay! After you have confirmed your subscription you’ll receive an email called “your monthly planner from Clementine Creative”. In that email will be a link on how to access the May printable. Please check your spam folder if you can’t find that email. If you have any problems, feel free to email me at carmia @ clementinecreative.co.za. I looked at the kikki.K brandbefore settling on a Saffiano personal organiser from Filofax. I’ve heard a lot about the kikki.K organiser, so let me know how you get on with and how you think it compares to other organisers. Great printables this month too by the way! Hey Ali! Just checked out the Saffiano organiser and it looks just as adorable. I like the leather cover! Will let you know how I get on with this one 🙂 Thanks for supporting my blog! I am a subscriber but I have been unable to access the May planner? I see April and March but can’t seem to access the most recent planner! HELP! Hey Cynthia, I have sent you an email with the May planner. Let me know if you didn’t receive it. The same thing has happened to me. I cannot access the May planner, even when I am signed in. Hey Janet, I have sent you an email with the May planner. Let me know if you didn’t receive it. Hello Martyna, thanks for letting me know. I’ve just sent you an email. Hello. I recently subscribed and I’m not sure if I’m getting Mays calendar or not. Hi Patricia, thanks for letting me know.. I have just sent you an email regarding the calendar. Hi, I can’t figure out how to download the May printable…can you help me with that? Thank you! Hello Nikki, thanks for your interest! All you need to do is sign up to my newsletter here: http://www.clementinecreative.co.za/subscribe. After confirming your subscription you’ll receive an email called “your monthly planner from Clementine Creative”. In that email will be a link on how to access the May printable. If you have any problems, feel free to email me at carmia @ clementinecreative.co.za. I´ve just subscribed but I didn’t want to miss may’s calendar. Hey Natsu, no problem, I have just sent you an email. Hi Benita, I’m afraid I don’t understand what you mean. Can you please elaborate? My planner is color crush size personal. How do I change the measurements of your inserts to fit in my planner? Hi Benita, hmm that’s a tough one. I haven’t tried it myself before. 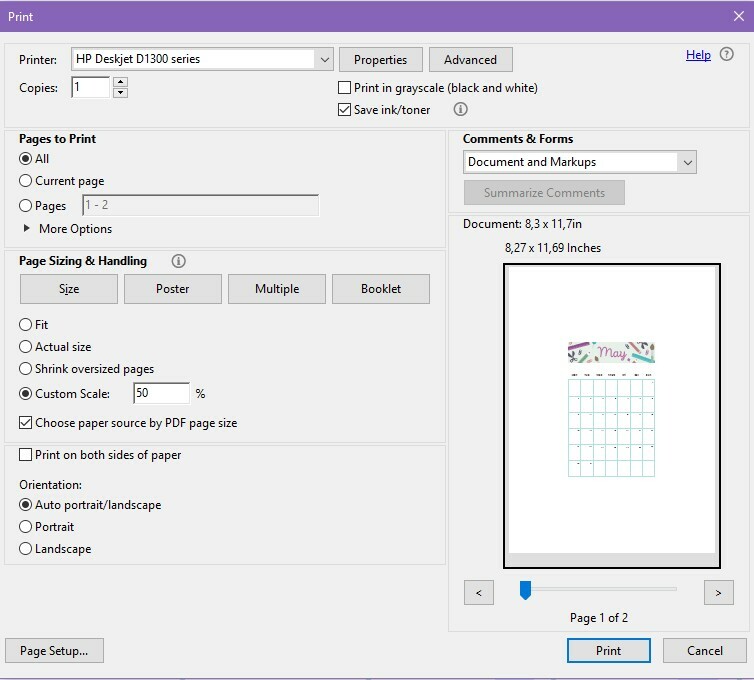 You can play around with the “custom scale” option in Adobe Reader. Here is a screenshot to show you what I mean. Here I opened the A4 size calendar and chose a custom scale of 50%. You will have to print it out and measure to see if it will fit your personal size planner. If not, choose a smaller %. I hope this helps, Benita! Have a great day. i love your website btw. thanks! i receive it right now. Glad to hear you got the email, Ana! It usually takes a few minutes 🙂 Thank you for subscribing!